Music is a big part of my families life. We love it! So today I thought to let my kids rock out and make there own music, after some thought we made a music corner. 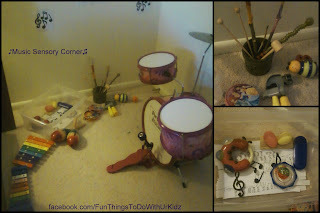 In our music corner we put all different instruments. One we made was using old easter eggs and filling them with little bit of rice and taping them shut, so they were Maracas. We also used things like toy hammers and sticks to make music with.